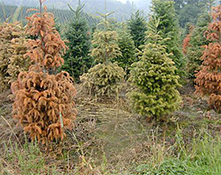 Azaleas and Rhododendrons and Fraser Fir are among the most susceptible. A partial list of other hosts includes Cedar, Boxwood, Cotoneaster, Dogwood, Elm, Lilac, Honey Locust, Juniper, Maple, Magnolia, Oak, Pine, Privet and Yew. 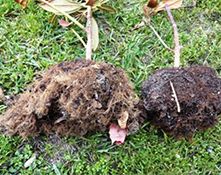 Both aerial plant tissues and roots may be infected. The lower leaf parts, petioles and stems of diseased plants develop a water-soaked appearance. Symptoms include wilting foliage and brown, rotted roots. Branches that have been invaded and girdled by the fungus wilt and die back. 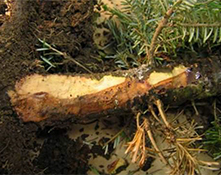 The diseased wood at the base of the branch near the soil line turns brown. Eventually the plant rots off at ground level. Phytophthora is caused by soilborne plant pathogens that belong to the group of fungi known as water molds. Infection of plant stems and leaf petioles may develop when the fungus is splashed onto aerial plant parts. Spores that develop on infected stems and petioles may be washed down to infect roots. Plants weakened by drought stress or planted in wet, poorly drained soils are more susceptible to infection by Phytophthora spp. There is usually a distinct junction where the diseased wood meets the healthy wood and the stem may have been girdled. Confirm your field diagnosis by sending a sample to a local diagnostic service for positive identification of the fungus. Avoid overhead watering or wetting the foliage of susceptible plants. Fungicides are not effective if plants have already been infected; remove and destroy infected plants. Susceptible plants growing in close proximity to infected ones should be treated promptly with a preventative fungicide.